I'm Shelf-ish: Schade of Night by J.P. Wilder Book Feature - Win a $25 Amazon Gift Card! Schade of Night by J.P. Wilder Book Feature - Win a $25 Amazon Gift Card! Schade Lee, ex-FBI agent turned PI, is on a mission to prove her dreams wrong. 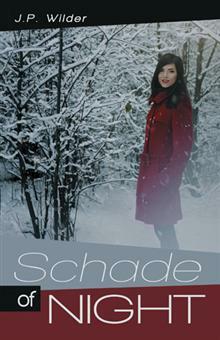 While on a case to find runaway Kylie Berson, Schade follows a gruesome path where she learns Kylie is in love with a serial killer with animalistic instincts. But what she does not know is that the killer is of supernatural origins, that she will inherit a demonic bloodline on her thirty-third birthday, and that she has had a guardian since birth. After the killer lures her to a frozen town, Schade meets her guardian, Kenan Quicke, who tells her they are allies with the same goal. But Schade, who has never made a habit of trusting strangers, decides to continue on her mission—just as she learns the killer has set his sights on her. His plan is to recover an ancient artifact and use it to steal her budding power at the height of her soul’s transition. Now, with help from Kenan, she must not only defeat the killer and destroy the artifact, but also face the Sentinels, a shadowy organization that intends to enslave her for their own purposes. In this fantasy tale, a private investigator on a mission to save a runway faces a surprising destiny that leads her into a dangerous world where she can trust no one but herself. .
J.P. Wilder is a Certified Public Accountant. When not crunching numbers or stumbling through fatherhood, he writes tales of dark sorcery and ferocious beasties and maintains a blog about gothic, urban, and high fantasy. J.P. and his wonderful wife, Marie, live in Southern California with their children. J.P. is giving away a $25 Amazon Gift Card!